Context: Solanum xanthocarpum Schrad and Wendl (Kaṇṭakāri) is a diffuse herb with prickly stem, traditionally used for the treatment of inflammation and one in the group of daśamūla (group of ten herbs) herbs commonly used drug in Ayurveda. Aims: In continuation of search for potent natural anti-inflammatory agents, the present research work was planned to evaluate the anti-inflammatory activity of ethanol extract of S. xanthocarpum whole plant. Settings and Design: The ethanol extract was evaluated at dose 10, 30 and 100 mg/kg p.o. in rats. Materials and Methods: Using pharmacological screening models carrageenan induced rat paw edema, histamine induced rat paw edema and cotton pellet granuloma in rats. Statistical Analysis Used: Data obtained was analyzed statistically using analysis of variance followed by post-hoc Dunnett test, P < 0.05 is considered as statistically significant. Results: Acute treatment didn't show anti-inflammatory activity against carrageenan and histamine induced paw edema. However, administration of 100 mg/kg p.o for 7 day reduced the granuloma formation in cotton pellet granuloma model. Conclusions: Present results support the traditional use of plant for anti-inflammatory activity. In brief, the results provide scientific pharmacological basis for the therapeutic use of S. xanthocarpum. According to the literature review, there is a paucity of scientific data for anti-inflammatory activity of the whole plant. The present research work, therefore, was initiated to investigate the anti-inflammatory activity of ethanol extract of S. xanthocarpum whole plant in laboratory animals. The plant material was collected from the local source in Satara district in Maharashtra state. The plant material was authenticated by Botanical Survey of India (Government of India Ministry of Environment and Forests), Pune. Carrageenan (Thermosil, Fine Chem., India), histamine (Research Lab Fine Chemical, India), distilled water, anesthetic ether (Rachana Ether Pvt. Ltd, India), ethanol, Surgical sutures (Johnson and Honson Ltd., India), Surgical cotton (Mamta Surgical Cotton Industries, India), Soxhlet apparatus, Plethysmometer (Orchid Scientific PLM02, India). The collected S. xanthocarpum plant material was made into small pieces, shade-dried and coarsely powdered using a pulverizer. The coarse powders were subjected to extraction with ethanol using Soxhlet apparatus. The extracts were collected and evaporated at atmospheric pressure and the last trace of the solvents was removed in-vacuo. The prepared extract was used for screening of anti-inflammatory activity. Wistar rats required for the study were obtained from Institute's animal house facility. They were housed in polypropylene cages, six animals per cage, in an air-conditioned area at 25 ± 2°C with 10:14 h light and dark cycle at relative humidity of 45-55%. They were given Nutrimix Std. 1020, laboratory animal diet (Nutrivet Life Sciences, Pune) animal feed and Aquaguard-purified water ad libitum. The food, but not water was withdrawn 3 h before the experiment. The animal experiment was carried out after obtaining the approval of animal experimental protocol by the Institutional Animal Ethical Committee of Jayawantrao Sawant College of Pharmacy and Research, Hadapsar, Pune, constituted as per guidelines of "Committee for Purpose of Control and Supervision of Experimental Animals," India. The preliminary doses were selected based on the literature review and results of acute toxicity study. If the literature is devoid of any such reference then the 10 times less dose of lethal dose 50% (LD50) was the maximum dose and subsequent two more ½-log doses below the maximum dose level was selected for the preliminary study. Suitable dosage forms of extract were prepared on the day of the experiment. The acute oral toxicity (AOT) study of the extract was performed as per the Organization for Economic Co-operation and Development (OECD) guidelines 425 at a limit dose of 2000 mg/kg. Animals were observed individually at least once during the first 30 min after dosing, periodically during the first 24 h (with special attention given during the first 4 h) and daily thereafter, for total 14 days for sign of toxicity and/or mortality if any. The LD50 was calculated by using OECD 425 (AOT) software. The interpretation of the results was performed by applying statistical analysis, which included one-way analysis of variance followed by post-hoc Dunnett test, P < 0.05 is considered as statistically significant. 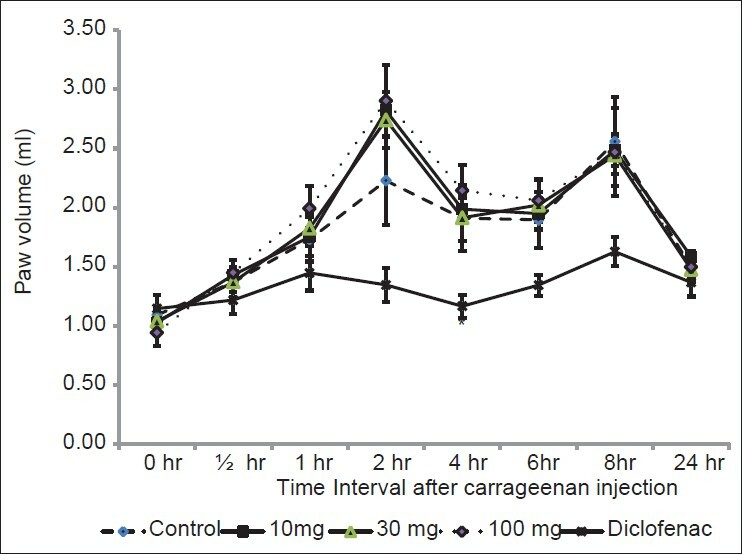 Subcutaneous injection of carrageenan 0.1 ml of 1% solution in the sub-plantar region induced edema in rat paw in the control group. The administration of S. xanthocarpum extract (SxE) 10, 30 and 100 mg/kg p.o 1 h before carrageenan didn't show anti-inflammatory activity at any time interval. Diclofenac sodium showed a decrease in inflammation at all intervals, but significant (P < 0.05) decrease was observed only at 4 h [Figure 1]. Administration of histamine subcutaneously in rat paw induced inflammation of paw in the control group. Administration SxE 10, 30 or 100 mg/kg p.o didn't show significant changes in paw volume [Figure 2]. The drug SxE at 100 mg/kg p.o. was able to reduce the inflammatory process of granuloma formation in rats after the treatment period of 7 days in comparison with vehicle [Table 1]; this was evident from the reduction of both wet and dry weights of the cotton pellets. However, reduction in weight of pallet in both cases was not significant. Treatment with diclofenac sodium (10 mg/kg p.o.) also significantly (P < 0.05) reduced the granuloma. In the present study, ethanolic extract of S. xanthocarpum showed non-significant changes in the histamine induced paw edema. Cotton pellet implantation is the most suitable method for studying the efficacy of drugs against proliferative phase of inflammation. The cotton pellet granuloma method has been widely employed to assess the transudative, exudative and proliferative components of chronic inflammation and is a typical feature of established chronic inflammatory reaction. The fluid absorbed by the pellet greatly influences the wet weight of the granuloma and the dry weight correlates well with the amount of granulomatous tissue formed. In chronic inflammation, monocyte infiltration and fibroblast proliferation take place. This proliferation becomes widespread by the proliferation of small vessels or granuloma. NSAIDs decrease the size of granuloma, which results from cellular reaction by inhibiting granulocyte infiltration/inflammation, preventing generation of collagen fibers and suppressing mucopolysaccharides. In the present investigation, the SxE 100 mg/kg showed a non-significant decrease in the wet weight and dry weight of the cotton palette granuloma indicating that chronic administration of the drug reduces the proliferation of fibroblast as well as fluid accumulation in chronic inflammation in a weak manner. 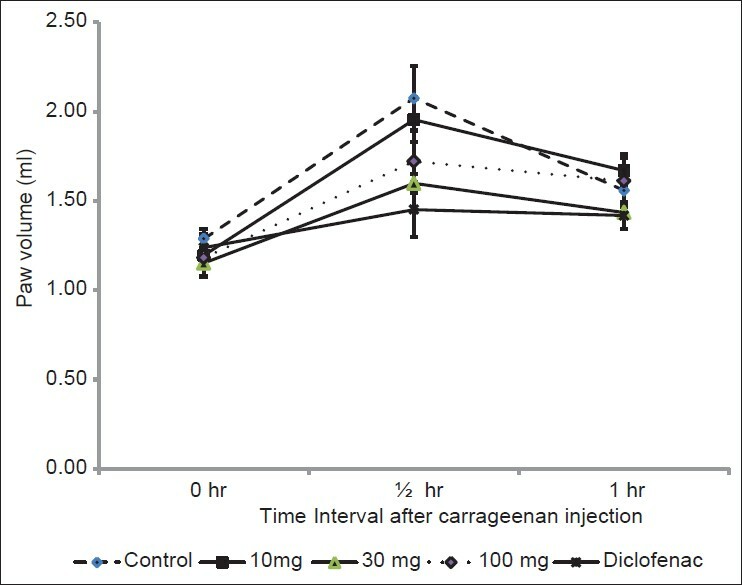 In conclusion, ethanol extract of S. xanthocarpum on acute oral administration was unable to reduce inflammation induced by carrageenan and histamine; however, on chronic administration it exhibits weak reduction of the granuloma formation suggesting its role in the inhibition of proliferative phase of the inflammation. In Ayurvedic text S. xanthocarpum fruits are recommended for the anti-inflammatory activity. It is also scientifically proved that extract of dried fruits of S. xanthocarpum possess anti-inflammatory activity at 500 mg/kg p.o. In the present study whole plant extract was used at the maximum dose 100 mg/kg p.o. which may not be sufficient to produce the anti-inflammatory effect in the acute phase; however in chronic administration, it reduced the proliferative phase of inflammation. The anti-inflammatory activity after chronic administration of SxE is found non-significant, which may be due to the less quantity of chemical constituent present in whole plant as compare to fruits alone. Thus, present study supports the recommendation of fruits instead of whole plant for the treatment of inflammation in traditional medicinal system. Authors are thankful to Professor T. J. Sawant JSPM, Pune Maharashtra for providing necessary facilities to conduct the research work. Authors are also thankful to assistant professors Ms. Farhin Khan and Ms. Ramya Murthy for their contribution in this research work. 1. Kirtikar KR, Basu BD. Indian medicinal plants. 2 nd ed., Vol. 3. Dehradun: International Book Distributors; 2008. p. 1760. 2. Nathan C. Points of control in inflammation. Nature 2002;420:846-52. 3. Kolattukudy PE, Niu J. Inflammation, endoplasmic reticulum stress, autophagy, and the monocyte chemoattractant protein-1/CCR2 pathway. Circ Res 2012;110:174-89. 4. Brunton LL, Parker KL, editors. Goodman and gilman's manual of pharmacology and therapeutics. New York: McGraw-Hill; 2008. p. 434-60. 5. Consumer Reports Health Best Buy Drugs. The Nonsteroidal Anti-inflammatory Drugs: Treating Osteoarthritis and Pain. 101 Truman Avenue Yonkers, NY :Consumers Union of United States, Inc.; 2011. p. 1-22. 6. De Smet PA. The role of plant-derived drugs and herbal medicines in healthcare. Drugs 1997;54:801-40. 7. Carlini EA. Plants and the central nervous system. Pharmacol Biochem Behav 2003;75:501-12. 8. Houghton PJ, Seth P. Plants and the central nervous system. Pharmacol Biochem Behav 2003;75:497-9. 9. Calixto JB, Otuki MF, Santos AR. Anti-inflammatory compounds of plant origin. Part I. Action on arachidonic acid pathway, nitric oxide and nuclear factor kappa B (NF-kappaB). Planta Med 2003;69:973-83. 10. Phillipson JD. 50 years of medicinal plant research-Every progress in methodology is a progress in science. Planta Med 2003;69:491-5. 11. Sharma PC, Yelne MB, Dennis TJ. Database on medicinal plants used in Ayurveda. Vol. 4. New Delhi: C.C.R.A.S, Dept. of I.S.M. and H, Ministry of Health and Family Welfare, Govt. of India; 2001. p. 269-87. 12. Pardhi P, Jain PA, Ganeshpurkar A, Rai G. Anti-microbial, anti-oxidant and anthelmintic activity of crude extract of Solanum xanthocarpum. Pharmacogn J 2010;2:400-4. 13. Roshy JC, Ilanchezhian R, Patgiri BJ. Therapeutic potentials of kantakari (Solanum xanthocarpum Schrad. and Wendl.). Ayurpharm Int J Ayur Alli Sci 2012;1:46-53. 14. Singh OM, Singh TP. Phytochemistry of Solanum xanthocarpum: An amazing traditional healer. J Sci Ind Res 2010;69:732-40. 15. Gupta R, Sharma AK, Sharma MC, Dobhal MP, Gupta RS. Evaluation of antidiabetic and antioxidant potential of lupeol in experimental hyperglycaemia. Nat Prod Res 2012;26:1125-9. 16. Hussain T, Gupta RK, Sweety K, Khan MS, Hussain MS, Arif M, et al. Evaluation of antihepatotoxic potential of Solanum xanthocarpum fruit extract against antitubercular drugs induced hepatopathy in experimental rodents. Asian Pac J Trop Biomed 2012;2:454-60. 17. Govindan S, Viswanathan S, Vijayasekaran V, Alagappan R. A pilot study on the clinical efficacy of Solanum xanthocarpum and Solanum trilobatum in bronchial asthma. J Ethnopharmacol 1999;66:205-10. 18. Kar DM, Maharana L, Pattnaik S, Dash GK. Studies on hypoglycaemic activity of Solanum xanthocarpum Schrad. and Wendl. fruit extract in rats. J Ethnopharmacol 2006;108:251-6. 19. Poongothai K, Ponmurugan P, Ahmed KS, Kumar BS, Sheriff SA. Antihyperglycemic and antioxidant effects of Solanum xanthocarpum leaves (field grown and in vitro raised) extracts on alloxan induced diabetic rats. Asian Pac J Trop Med 2011;4:778-85. 20. Hussain T, Gupta RK, Sweety K, Eswaran B, Vijayakumar M, Rao CV. Nephroprotective activity of Solanum xanthocarpum fruit extract against gentamicin-induced nephrotoxicity and renal dysfunction in experimental rodents. Asian Pac J Trop Med 2012;5:686-91. 21. Kumar S, Sharma UK, Sharma AK, Pandey AK. Protective efficacy of Solanum xanthocarpum root extracts against free radical damage: Phytochemical analysis and antioxidant effect. Cell Mol Biol (Noisy-le-grand) 2012;58:174-81. 22. Sultana R, Khanam S, Devi K. Immunomodulatory effect of methanol extract of Solanum xanthocarpum fruits. Int J Pharma Sci Res 2011;2:93-7. 23. Kumar N, Prakash D, Kumar P. Wound healing activity of Solanum xanthocarpum Schrad. and Wendl. fruits. Indian J Nat Prod Resour 2010;1:470-5. 24. Patel P, Patel M, Saralai M, Gandhi T. Antiurolithiatic effects of Solanum xanthocarpum fruit extract on ethylene-glycol-induced nephrolithiasis in rats. J Young Pharm 2012;4:164-70. 25. Purohit A. Contraceptive efficacy of Solanum xanthocarpum berry in male rats. Anc Sci Life 1992;12:264-6. 26. Salar RK, Suchitra. Evaluation of antimicrobial potential of different extracts of Solanum xanthocarpum Schrad. and Wendl. Afr J Microbiol Res 2009;3:97-100. 27. Gavimath CC, Kulkarni SM, Raorane CJ, Kalsekar DP, Gavade BG, Ravishankar BE, et al. Antibacterial potentials of Solanum indicum, Solanum xanthocarpum and Physalis minima. Int J Pharma Appl 2012;3:414-8. 28. Anwikar S, Bhitre M. Study of the synergistic anti-inflammatory activity of Solanum xanthocarpum Schrad and Wendl and Cassia fistula Linn. Int J Ayurveda Res 2010;1:167-71. 29. Vogel HG, editor. Drug discovery and evaluation: Pharmacological assays. 2 nd ed. New York: Springer-Verlag; 2002. p. 670-1. 30. Arulmozhi DK, Veeranjaneyulu A, Bodhankar SL, Arora SK. Pharmacological investigations of Sapindus trifoliatus in various in-vitro and in-vivo models of inflammation. Indian J Pharmacol 2005;37:96-102. 31. Kale M, Misar AV, Dave V, Joshi M, Mujumdar AM. Anti-inflammatory activity of Dalbergia lanceolaria bark ethanol extract in mice and rats. J Ethnopharmacol 2007;112:300-4. 32. Fang QM, Zhang H, Cao Y, Wang C. Anti-inflammatory and free radical scavenging activities of ethanol extracts of three seeds used as "Bolengguazi". J Ethnopharmacol 2007;114:61-5. 33. Radhika P, Rao PR, Archana J, Rao NK. Anti-inflammatory activity of a new sphingosine derivative and cembrenoid diterpene (lobohedleolide) isolated from marine soft corals of Sinularia crassa TIXIER-DURIVAULT and Lobophytum species of the Andaman and Nicobar Islands. Biol Pharm Bull 2005;28:1311-3. 35. Suleyman H, Gul HI, Gul M, Alkan M, Gocer F. Anti-inflammatory activity of bis (3-aryl-3-oxo-propyl) methylamine hydrochloride in rat. Biol Pharm Bull 2007;30:63-7. 36. Arya S, Kumar VL. Antiinflammatory efficacy of extracts of latex of Calotropis procera against different mediators of inflammation. Mediators Inflamm 2005;2005:228-32. 37. Tamaddonfard E, Farshid AA, Hosseini L. Crocin alleviates the local paw edema induced by histamine in rats. Avicenna J Phytomedicine 2012;2:97-104. 38. Ramprasath VR, Shanthi P, Sachdanandam P. Anti-inflammatory effect of Semecarpus anacardium Linn. nut extract in acute and chronic inflammatory conditions. Biol Pharm Bull 2004;27:2028-31.